According to the data and stats that were collected, 'Bits and Boxes' channel has an excellent rank. Despite such a rank, the feed was last updated more than a year ago. In addition 'Bits and Boxes' includes a significant share of images in comparison to the text content. The channel mostly uses long articles along with sentence constructions of the basic readability level, which is a result indicating a well-balanced textual content on the channel. Subscription Box Reviews and a bit of craftiness, gardening and life in general. Long articles are widely used on 'Bits and Boxes' as elaborated and interesting content can help the channel to reach a high number of subscribers. In addition there are a few medium length articles. 'Bits and Boxes' mostly contains texts of a basic readability level which may show their aim to reach a wider audience. Besides, there are articles of intermediate readability, which make up more than a quarter of all content on the channel. Unfortunately Bits and Boxes has no news yet. Bespoke Post Coupon Code! Perfect for Valentine's Day! Box O' Munch January 2015 Classic Snack Box Review and Coupon Code! Loot Crate February 2015 Theme and Free Gift with Sign Up! 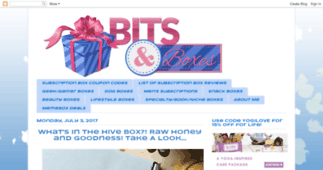 The latest news from Gift Boxes Australia - Get Boxed.